Black cardigans have been a staple of my closet since high school. This would be black cardigan number Five in my closet currently, not to be confused with the black velvet blazer collection. Thankfully, both work with the black wool pleated Talbots skirt collection and the black velvet pants collection I’ve got going on. I wear a lot of black. 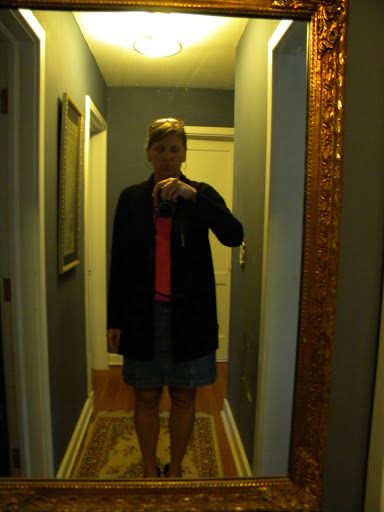 And the same styles, clearly, if you are familiar with the demin skirt (as seen above) that my college girlfriends have pointed out I’ve worn since at least 1992. Although the one I’m wearing there is a newish one, acquired this summer while thrifting. Edie has taken to calling me ‘goth mom’. Apparently, she didn’t get the memo that my style hasn’t changed since 1986, despite adding some charcoal grey in the form of cardigans and at least one wool pleated Talbots skirt and the occasional pink shirt as seen above. The lines of this new one are divine. And it’s cashmere. And the price was just right. Ultimately, both Edie & Betty highly approved my purchase, even if it’s yet another black cardigan. I did try something new in the kitchen today though. 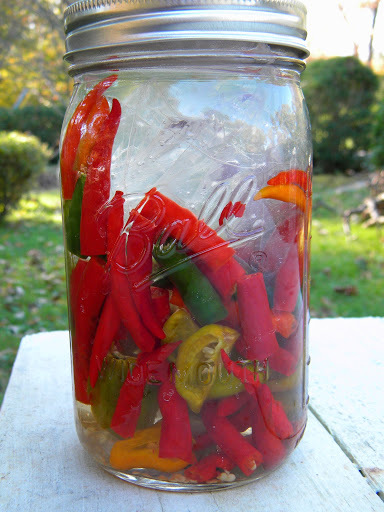 I’m on this quest to make a good hot sauce. 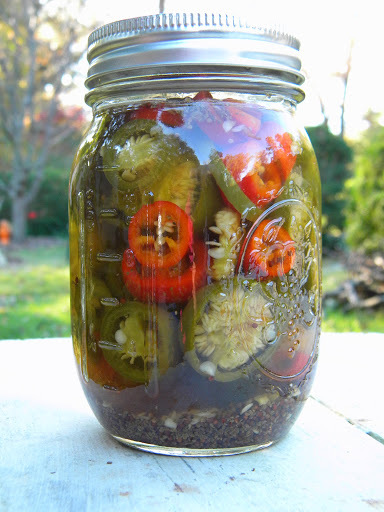 Something more interesting than just peppers and vinegar. I’ve read that fermenting is the key to Tabasco, so why not try that as my first step? Pat’s dad, Grandpa Jack, brought me a grocery bag of habarenos that I combined with various chili’s. I can already tell you that you need eye protection when opening the jar the fumes are so hot. Should be good stuff. But of course while trying something new, I had to go with what I know. We opened a jar of last year’s batch a few weeks ago to eat on some nachos and they were so good we ate the entire jar. I think I used this recipe in making that batch (I used like 3 different pickled pepper recipes last summer and this one I identified by the spices in the bottom of the jar, I think.) so I went with that one again. There are some baby pablanos in there, some jalapenos that had turned red that Grandpa Jack shared with us and then a boatload of jalapenos from our garden in there. It’s worth noting that I finally remembered to wear gloves. Although I did cut into the first habareno, rub my lips and then realize I should put some gloves on. The tingling wasn’t nearly as bad as last time though. This something new kick started the other day when I brought some beets home from the farmer’s market. We like the idea of them, but I never seem to make them. So I set about fixing that. You know what? We still only like the idea of them. The reality is, they taste like dirt. We are still willing to try some pickled, but we, as a family, may be quite willing to declare ourselves beet free. As the saying goes, if it ain’t broke, don’t fix it. In our house, that clearly applies to things like beets, pickled peppers and black cardigans. Did I mention the new one was cashmere? More on biscuits, plus a salad. I'm a beet lover. And a black cashmere cardigan lover. As far as style goes, some things are classic (like black cardigans) and never go out of style. You can never have too many black sweaters, especially if they're cashmere. I have the same problem with navy cardigans.